Browse all Normandy Estate Homes for Sale below. 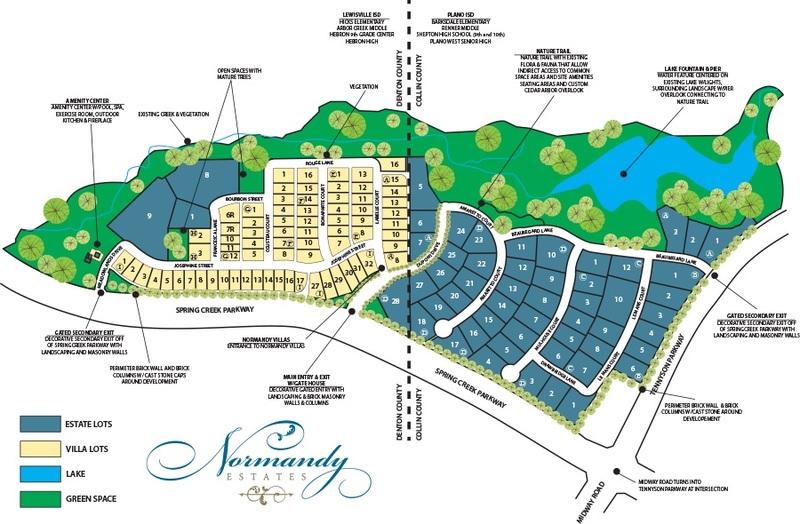 Normandy Estates is a gated residential community that straddles the Denton and Collin county line. It also straddles the Lewisville and Plano School districts with the far west side of the community attending LISD and the east side of the community attending PISD. This neighborhood is located in the far northwest corner of the 75024 Zip Code. The community is flanked by Kings Gate and Kings Ridge neighborhoods and has easy access to the Dallas North Tollway and the Sam Rayburn Tollway. The homes in this community range from 800k to 2.4 Million and were built between 2008 and 2017. Residents of this community will enjoy having just a short drive to get to all the local shopping and restaurants. The Shops of Legacy, Legacy West, Nebraska Furniture Mart, IKEA, Stonebriar Country Club, Stonebriar Mall and the Dallas Cowboys Training Center are all less than 10 minutes away.